Yuqian and I will have a paper at ICAPS on “Open World Planning for Service Robots,” the first conference publication to come from UT Austin’s RoboCup@Home team! 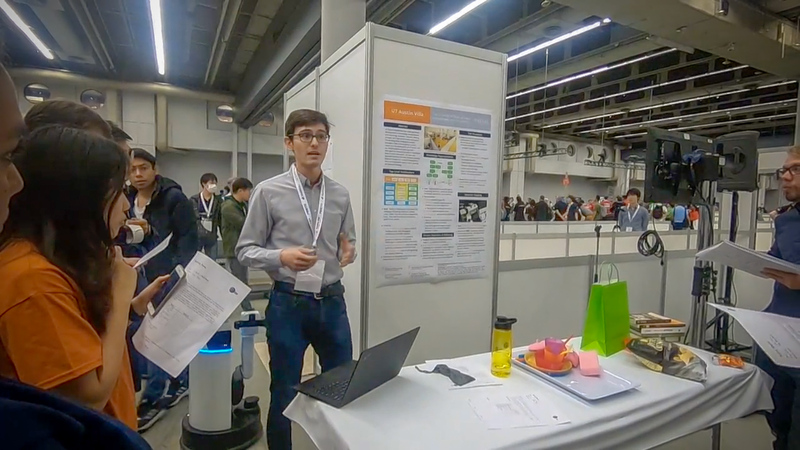 Jesse’s work on improving a robot’s semantic parser through interaction was accepted at ICRA 2019. An earlier workshop version gives the thrust. We put down some of our thoughts after more than a year of thinking about RoboCup@Home. LAAIR gives the outline of how we’ve put together a general purpose reasoning system and more conventional robotics components to address the challenge of building a general-purpose service robot. The second argues that there are synergies in domestic and office service robotics research efforts, and highlights what the @Home competition has to offer for researchers interested in service robots. I’m excited to be joining a great group. I’m excited to meet my new peers. I’m excited for new robots. I’m excited to live in a beautiful city in a beautiful state. I’m excited to be go listen to the Seattle Symphony. I’m excited to be one of the first to experience a beautiful new building. Yours truly presenting the poster to the judges. Courtesy Arnau Canyadell. I was fortunate to get to work with UT Austin Villa one more time for my last summer in Texas. Yuqian Jiang, Justin Hart and I spent quite some time putting a poster together describing the team’s research direction, and I am grateful that the team let me present it in Montreal. I had the honor of speaking on behalf of the College of Natural Science’s graduating Astronomy, Chemistry, Computer Science, Mathematics, and Physics majors. A video is available, and below you’ll find an annotated version of the address. Yours truly at the podium. Courtesy of Vivian Abagiu via CNS. Good afternoon. Friends, family, faculty and staff: thank you for being here. We would not have made it this far if it were not for your support. Students; when you applied to graduate, you had to verify that your degree audit was in order. Maybe you spent some time looking at the long list of classes you’ve taken, and maybe you—like me—wondered where the years had gone. As a peer, I don’t have much wisdom to share, but I will share a couple vignettes that I hope remind you of some of our shared experiences. Early in my first semester, a professor ran a poll asking what our post-graduation plans were. It was a science class in a big auditorium in Welch, filled with bright students, and two thirds of those bright students said that they intended to go to medical or graduate school. I was in the minority. Being self-assured in my industry-bound trajectory, I was confident that this was not my path. Of course, that changed. You too have changed. Maybe you thought one way about your future, and now you think differently. Maybe you switched majors, maybe you joined natural sciences later in your time at UT. Maybe you disliked the canoe sculpture, but it’s actually started to grow on you. What was it that spurred your change? For me, it was the Freshman Research Initiative. In my second semester, I joined the autonomous robotics stream. I didn’t have a particular interest in the field, but Matteo Leonetti, the research educator, gave a strong case for why we should care about artificial intelligence. More than anything else, I found his investment and passion persuasive. So though I hadn’t planned to, I stayed with the stream. Matteo helped me find an interest. When Matteo left to take a faculty post, I began to work with his successor, Jivko Sinapov. I recall discussing my interests with him, and he helped me put them into context, pointing me towards papers from a young professor at the University of Washington. I remember that he even made sure I was able to spell her name correctly to look her up. It was a good recommendation. Next semester, almost a two years after I first learned about her, I’ll join her group as a Doctoral student, working to make robots that anyone can teach to accomplish useful tasks. So, Jivko helped me find a direction. Clearly, the program and professors had a large impact on me. This college, this university, is filled with high quality people, and I’m sure that you have benefited from their instruction, their expertise, and their guidance as well. Whether you measure it by number of lives saved, number of citations, or number of quotes in the New York Times, our professors give us a model for how to be forward thinkers and upstanding people. If we ever think we have nothing left to achieve, we can look to them. Of course, it wasn’t all about professors. We’ve spent the vast majority of our time with each other. Last year, I went to hear a friend present their thesis. It was excellent, and they’ve since graduated, but I remember how I felt seeing them then. I felt proud, proud to be at a place where students were doing such good work, and, overwhelmingly, I felt inspired to live up to the standard they set. I felt energized. It’s a feeling I’ve had again and again these past weeks, whether it was while seeing my fellow Polymathic Scholars finish their research, or talking to friends about their org events or hearing people’s post-graduation aspirations. I hope you realize that—like my friend did for me—you too have inspired others. Think about all the times you worked through the night on an assignment together. Think about all the times you supported each other when that turned out to not be enough. Think of your time as an undergraduate teaching assistant or peer mentor. Think of the organizations you’ve started or sustained. Think of the impact of your service and leadership. Think of all of it. You taught and you learned from one another. You animated each other and this campus. This—all of this—is where the years went. It may not be obvious for each of us—our blood didn’t turn orange—but we have all been shaped by this university. It’s pointed us towards the problems that matter, and helped sharpen our knowledge and abilities towards their resolution. It’s connected us with each other, and with others graduated and yet to graduate. 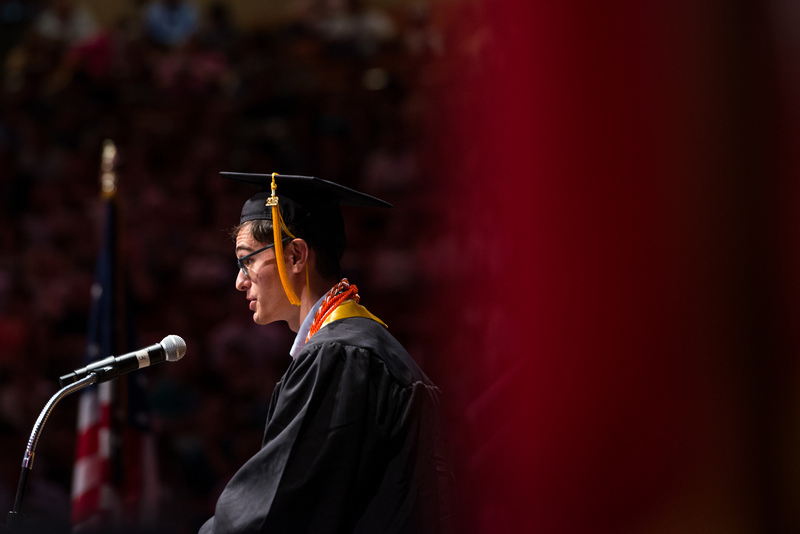 Whether your near future contains classes, work, time off or something else, know that UT has given you an incredible jumpstart.